“If he wants a solution, that’s a step backward,” said Senator John Cornyn of Texas, the No. 2 Republican in the Senate. Roughly 800,000 young people brought to this country illegally have been protected from deportation under an Obama-era initiative, Deferred Action for Childhood Arrivals, or DACA. But Mr. Trump rescinded the program in September, giving Congress six months — until March 5 — to come up with a replacement. Now the Senate has a new immigration deadline: Feb. 8, the date that a stopgap spending measure approved on Monday will expire. Mr. McConnell has said that if the fate of the young undocumented immigrants is not resolved by then, he will allow the floor debate on immigration. But hard-liners on immigration were not budging. Such voices would dominate debate in the House, where twice, in the Obama and George W. Bush presidencies, bipartisan comprehensive overhauls of the nation’s immigration laws have died. But senators, given the green light by their leaders, pressed ahead. If nothing else, passage of a bipartisan immigration bill in the Senate would shift the political focus to the House, where the bulk of the 2018 election will be fought. As lawmakers are racing to a conclusion, so are the courts. After a federal judge ruled that Mr. Trump could not summarily end the DACA program, the Justice Department appealed to the Supreme Court. The Supreme Court said Tuesday that it would consider the case on an expedited basis, and ordered both sides to submit briefs by Feb. 2. Senator Richard J. Durbin, Democrat of Illinois, and five other senators of both parties proposed a measure that would have provided a path to citizenship for young unauthorized immigrants and would have met some of President Trump’s border security demands. But one thing is certain: The president and his allies on Capitol Hill will almost certainly reject any proposal that does not include funding for the “big, beautiful wall” that Mr. Trump promised to build along the southern border, though he had said Mexico would pay for it. The administration has asked Congress for $18 billion to build the wall; Mr. Cornyn said that in negotiations with the White House before the shutdown, Mr. Schumer had offered the president $25 billion. 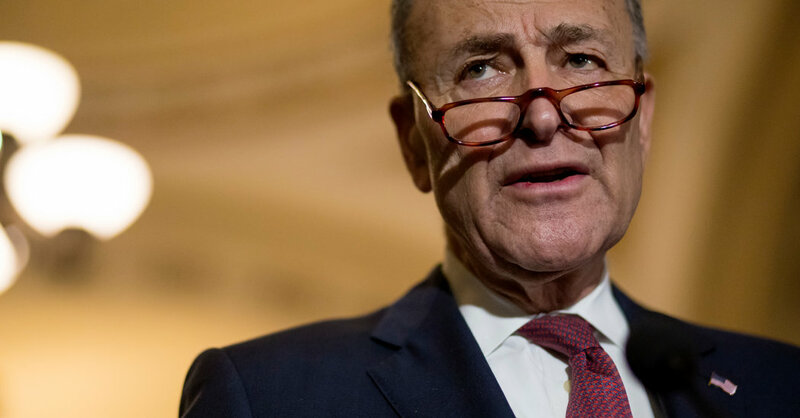 A spokesman for Mr. Schumer declined to comment but did not dispute the figure. The week before the shutdown, a bipartisan group of six senators led by Richard J. Durbin, Democrat of Illinois, and Mr. Graham proposed a measure that would have provided a path to citizenship for DACA recipients, as well as more than $2.5 billion for border security and a grant of protected status for the parents of the Dreamers, who would be barred from sponsoring their parents for citizenship. But Mr. Trump objected to that plan during a White House meeting in which he used vulgar, insulting language to describe African immigrants. That rejection and the ensuing firestorm set back the talks. At the White House on Tuesday, Ms. Sanders underscored the administration’s opposition to the proposal. From the briefing room podium, Ms. Sanders rejected it as a potential part of a framework for a new deal. “It’s totally unacceptable to the president and should be declared dead on arrival,” she told reporters. That was not the sense on Capitol Hill on Tuesday. Lawmakers who have been working to resolve the DACA recipients’ status confessed that they did not know where they were headed. Asked what the next step would be, Mr. Durbin shrugged. While Mr. Durbin has suggested that the Durbin-Graham proposal should be the starting point for negotiations, Senator Jeff Flake, an Arizona Republican who has been a key participant in the bipartisan talks and has a history of bucking his party on immigration, said that would not be the case. Talks that helped end the shutdown were led by a group of about 25 senators — Republicans, Democrats and an independent — who called themselves the Common Sense Coalition. They met in the office of Senator Susan Collins, Republican of Maine.